How to Make Good Coffee at Home – With What You Already Have! 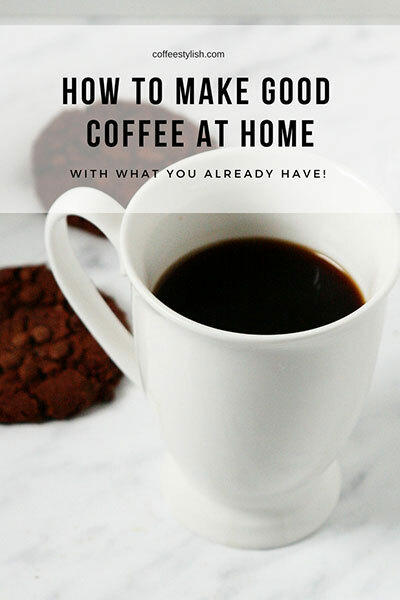 How to make good coffee at home- with what you already have! We all know you can make good coffee with fresh coffee beans or expensive equipment, but you may not realize there are many other things you can easily do to make your coffee taste better, without spending a dime! Water is one of the most important things when it comes to brewing a good cup of coffee. Refilling the water tank with fresh water every morning is the best thing you can do. Just quickly rinse the tank and refill with fresh water. If you have a large tank, you don’t need to fill it all the way up – add enough water needed for as many cups as you usually drink and refill the next morning. A removable water tank is the best thing because it’s so easy to keep clean and mold free. Filtered water is recommended, but you may use tap or bottled water as well – you just want the water to always be fresh. For a good tasting coffee, you really do have to keep the coffee maker clean. Discard the grounds and hand wash the carafe and the filter basket with a mild detergent after each use. If your coffee tastes bitter or burnt or has an unpleasant aftertaste, oil buildups might be the reason. Thoroughly clean the filter holder and filter basket. Use a toothbrush or a paper towel to clean all parts that come in contact with coffee and remove oils. You can occasionally run a quick rinse with Urnex oil cleaner. Just like a removable water tank, coffee makers with brew basket that can completely be removed from the unit and cleaned make this job a lot easier. Depending on your usage and mineral content of water in your area, it is recommended to descale every 3 to 4 months. Descaling helps clean mineral build-up inside your machine and can help with poor performance. If your coffee maker doesn’t make hot coffee, or the coffee gets cold really fast, rinse your mug with hot water before you pour in the coffee. Simply pour in some hot water, wait for 15 seconds and discard water. This simple step will help keep your coffee hot much longer. Proper coffee to water ratio is a surefire way to make a good cup of coffee. I recommend using 2 tablespoons of coffee per 8 oz of water if you like strong coffee, or 1 1/2 tablespoon for a medium strong coffee. Here’s a useful chart. Choosing the roast level that fits your taste is the easiest way to make coffee you’ll like without any extra cost. No matter if you buy specialty coffee or grocery store brand, you want to pick the right roast. If you love your coffee strong and bold, choose dark roasted coffee (look for dark roast or French roast on the label). If you like a mild coffee taste, choose house blends – they are usually medium roasts. Breakfast blends are almost always light roasts. Knowing your favorite coffee roast level is especially useful when buying some coffee for the first time. If you want to make the best iced coffee at home (no matter what brewing method you’re using) try this: Use the same amount of water and coffee grounds you normally use for your morning brew, but replace half of the water with ice cubes. One large ice cube usually equals 1 oz water. So, if you use 2 tbsp coffee per 8 oz water, brew 2 tbsp coffee with 4 oz water and add 4 large ice cubes in a glass. 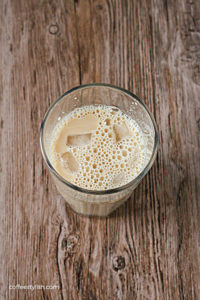 When you make the coffee, slowly pour the coffee over ice cubes, add a splash of milk or half and half and that’s it! Get full recipe here. With these simple rules, you’ll be able to make a great cup of coffee every morning, right in your home. These plastic-free coffee makers make the best coffee and they are so easy to clean! If you love coffee as much as I do, here’s a list of simple coffee recipes that you can easily make at home.